The ATH-AD500X Audiophile Open-Air Headphones from Audio-Technica feature 53mm drivers and a honeycomb aluminum casing that is designed to produce no sense of pressure on your ears. The headphones have self-adjusting 3D Wing Support Housing to assure a comfortable fit. The three-meter single-sided oxygen free cable has a TPE sheath to reduce tangles. Box Dimensions (LxWxH) 11.2 x 8.3 x 4.8"
ATH-AD500X Audiophile Open-Air Headphones is rated 4.7 out of 5 by 6. Rated 4 out of 5 by Clouldff7 from best under the 100 dollar open headphones The ath ad500x are something that everyone one wants but it is something that person should try. The sound is quite neutral lack a bit of bass although that is to be suspected since it is open but has great treble and clarity. The sound stage is flat out excellent. Know grado soundstage these soundstage are like those. Durability, it is made out of hard and doesn't feel like can break easily but the cord sure is quite good but too long like 11 or 12 feet long. I mean sure this is for home use but that is a really long cable. BTW, these are not recommend for outside use, the design is unique and it is quite big but light .comfort, no complaints from me but if your head is small it is not good for you for normal or large these good if not it it may fall off but for me it is like it is not there. Yeah, feels like it is not there. You don't really need a dac for this. Overall for the price it is excellent. BTW only get these if you live in a quiet environment. Doesn't suit well in noisy environment. 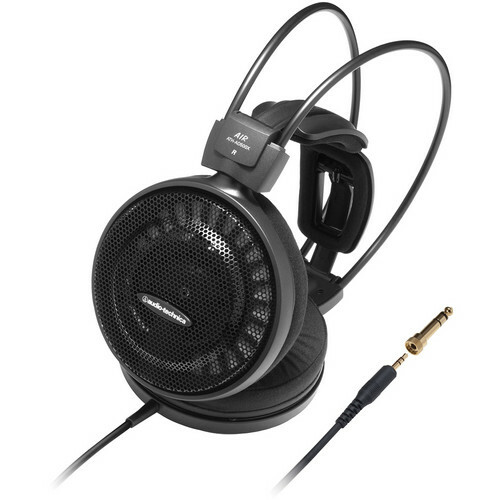 Rated 5 out of 5 by Toastyparty from Easy comparison to 500 audiophile headphones. Fantastic. Apart from my single con of not being able to resize to my head contour, where'as the bottom kind of squeezes harder that the top.... this headphones are TOP NOTCH. They sound amazing. Might even get an amplifier and see how far they can go before getting distorted, because straight out my pc, phone, or any other 3.5 device I've tested it so far you can easily max it out without getting any peak or distortion or clipping or anything. Rated 4 out of 5 by Ears Malone from Nice, Natural and Comfortable I use these as part of my mixing process when producing music. I find that an open-back headphone provides a more natural environment in which to judge the balance of the mix. By design these phones are not bass flattering, but that is exactly what the intention is, so I do not view that as negative. I use closed-back Sennheiser and AKGs phones for bass response scrutiny. Rated 5 out of 5 by 3lectroD4ve from My Favorite Cans These sound great! The bass response is just the way I like it. I can where these for hours without any discomfort. Rated 5 out of 5 by Affordable Audiophile from Good value in headphones I am listening to iFi micro iDSD BL, and want for nothing. Great value. The Affordable Audiophile. Rated 5 out of 5 by Aeroboogie from My first open headphone - and I am in love with it! I feelings I had almost got me to tears (honest!). I simply cannot put it into words how much I fell in love with these pair of cans. I am not an audiophile, but I did have a good old ATH-M50 from Audio-Technica for more than 3 years now - I loved those as well.... But once I tried an AD500x in a shop, and I knew that I would need to purchase one (or one of its bigger brothers (700x or 900x.) Finally I ended up purchasing a FiiO E17K "Alpen 2" portable amplifier/DAC as an accompaniment to the ATH-AD500x. (Which I also can suggest for anyone who wants to get great quality audio from their mobile phones or iPads. I just LOVE this pair of headphones right from the start. I think they kick bottom Even my wife's breath was taken away, when I made her sat down to listen to Adele's "Hello". :) Sure the cable could be shorter and easier to handle, but I knew this ahead of time from other reviews... but I did not buy these for the cable, but for their SOUND. And believe me, the sound is incredible. For audiophile headphones under 100 USD (!!!! ), you simply CANNOT make a better deal. They are not to take with you on journeys or business trips, but to wind back and relax at home with HiRes audio. As I write this review I am listening to Diana Krall - it's out of this world. So light and airy, huge soundstage and so comfortable feeling to wear them.... This is a 5 stars product (given price/value/performance ratios). Well done Audio Technica!